Do we improve interstate highway systems to increase traffic flow and allow goods and people to get further faster? Or, do we improve interstate highway systems to open land up for development purposes? If you're part of the Northwest Louisiana Council of Governments, your answer is probably: yes. That's incoherent. As we showed in Part 1 of this series, one of the principle justifications for building the I-49 Inner City Connector in Shreveport, LA is to bypass a congested portion of I-49. This will improve travel time, especially for truck traffic, and that is a principle benefit of the project. But why is there congestion in the first place? It's because I-49 through Shreveport has a series of interchanges where drivers enter and exit the interstate causing backups and slowdowns each day during prime commuting hours. Shreveport has, like cities all of North America, leveraged the investments in interstates to spur local development. Well certainly, then, the proposed $700 million Inner City Connector—a highway segment we're told is critical to our national transportation system—when it bypasses this traffic congestion will not include the types of interchanges and land development practices that has made the current I-49 problematic. In one of the more perverse aspects of federal highway construction, we use circular arguments to justify that which we want to do. Congestion is harming the Shreveport economy. We must build a highway to bypass the congestion. We must create congestion along the new highway to economically justify its construction. It's the circle of life. Highway construction that provides enhanced accessibility also provides real estate development opportunities that can stimulate economic growth. Those opportunities are governed by the future demand for real estate, as well as by the future supply of real estate. We can say almost anything with numbers. Project proponents have set forth the case that there is going to be over $800 million in annual economic benefit from the Inner City Connector in the form of salaries and wages (Table 13). What's problematic about that is that the number -- $800 million -- sounds impressive, but does't really communicate much. Is this new economic benefit that would not have happened without the highway? Are these jobs simply displaced from other parts of the city? Are these good jobs that build capital and wealth within the community or discount jobs with profits going somewhere else? Is this the best way to go about achieving this return? The LWC and shift-share methods provide similar estimates of overall employment growth of about 10 -13 percent over the decade. There are a couple of problematic things right away with this analysis. First, over the last 25 years, the population of Shreveport has actually shrunk from 186,000 in 1990 to an estimate of 184,000 in 2017. It's not at all clear where, or why, an increase in employment of 10-13% would even happen. They are projecting 30,653 new jobs just from this highway, and that's for a city with a population just over 200,000. That's ridiculous. More importantly, there is no internal consistency with this report's vision for the project area. One spreadsheet is projecting 3,600 trips per day. Another is projecting $800 million in economic benefit. If we assume each of these trips is a new employee commuting in to a new job, that's $220,000 in economic benefit per commuter. Even if we assume each trip is a carpool of four, that's $55,000 per employee in a place where the median household income is just $38,000. Those are not real numbers. And let's assume that each of these projected vehicles is a 4-person carpool, something patently absurd. That means 16,253 workers would need to come from new housing within the existing neighborhood. Is Shreveport going to build 12-20,000 new houses in the next decade simply because of a new highway loop? Again, that's ridiculous on its face. When we actually look at the jobs they are projecting, one in four of them are retail. Are the people of Shreveport suddenly going to start consuming more because of a new highway? Assuming the people of Shreveport today are buying toothpaste and toilet paper and other consumer goods -- which they are -- then where is this new consumption going to come from? Without population growth, what is driving this growth in jobs? Project proponents would say that growth always follows new highway construction. Build some interchanges and good things happen. This is true on its face, but it's only part of the story. New Jobs or Simply Displaced Jobs? There is no question that Shreveport can, through a $700 million transportation project, shift jobs and growth that would have happened in other parts of town to the Allendale region. 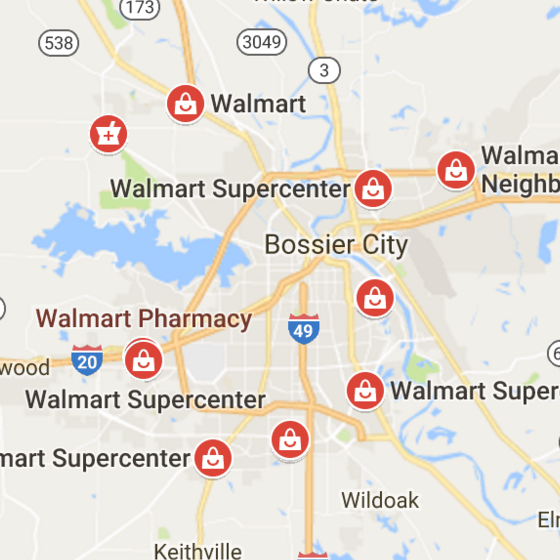 The Shreveport area has nine Walmarts. There are fourteen McDonalds. One or more of those -- the older ones that have gone past their short life cycle -- can easily be closed and a new one opened up near one of the new interchanges in Allendale. Is that economic benefit? According to the parameters of this study, it would be. The demand factors that most interest real estate developers are access to disposable income from consumers with unmet needs for products. The success of a retail development is based on providing a service or retail product closer to the residents of an area than the alternatives they currently have available. There is no doubt that real estate developers (and Wall Street financing firms) find it easier and more profitable to have the government make massive transportation investments to open up (subsidize) new land for development rather than going through the expense of rehabbing sites that were only designed to last a generation, at most. The only unmet need here is in the real estate community; it's their model that needs to change. The completion of the Inner City Connectors would provide substantially better highway access for commercial development in a large portion of the PSA. Moreover, the PSA has a plethora of adjudicated space owned by the City of Shreveport that should be redeveloped and brought back into commerce. The significant constraints on development are costs for raw land and for land assembly. The later constraint is due to the subdivision of the PSA into residential lots that must be assembled for commercial and industrial projects. This constraint could be reduced with a concerted effort to acquire and redevelop land within the PSA. Here's what this says. Real estate developers, with Wall Street financing, love to develop at and around interchanges. This project creates a number of those opportunities, especially since a lot of the land in the project area has gone back to the government (I suspect through tax default) and the government will be happy to gift it, or deeply discount it, for development (despite the fact that it's now worth way more post construction). The only potential cog in this plan is the stubborn neighbors who are still there, dotted throughout the neighborhood. If they cling to their properties and refuse to sell, it will make it hard to fully develop the project area. The city can nudge this process forward with "a concerted effort to acquire" the land. My guess is that the city's "concerted effort" will involve pre-construction values (low) for those stubborn land owners. And why not - should they get the gain from this $700 million subsidy or should that gain go to the real Americans who will take the big risks in developing the property (with additional subsidy and/or bailouts forthcoming from the state and federal government). The Easy Decision of What to Subsidize? A recent study commissioned by the Shreveport Planning Commission for the master plan suggested that 22% of 4100 new households to the region would be interested in urban living but that only 140-410 new households were possible downtown between 2008-2013, or perhaps 25-80 new households per year (W-ZHA March 5, 2010). Without a subsidy program to lower development costs, rents would exceed market rents downtown. This report actually suggests real demand -- as opposed to spreadsheet demand -- for urban living. The only obstacle is that the prices are so low, the current crowd of developers can't make money providing them. In fact, they suggest that in order to make it feasible there would need to be a subsidy program. We can't have that! That would be a distortion of the market! Instead, what we need is a $700 million non-subsidy transportation investment, along with a concerted city effort to acquire property for developers, so that real market forces can dictate a successful pattern of development. This is why we, at Strong Towns, scream No New Roads! This is why our approach to transportation funding needs to be dismantled. The Shreveport I-49 Inner City Connector is a particularly egregious project, but it's not that far outside of the bounds of normality. This kind of thought process is bankrupting cities, and hurting the real, real Americans in neighborhoods like Allendale all over the country. This assessment provides a probabilistic rather than deterministic forecast. None of this is real. It's all make believe. Sadly, Part 3 in this series is even more ridiculous.